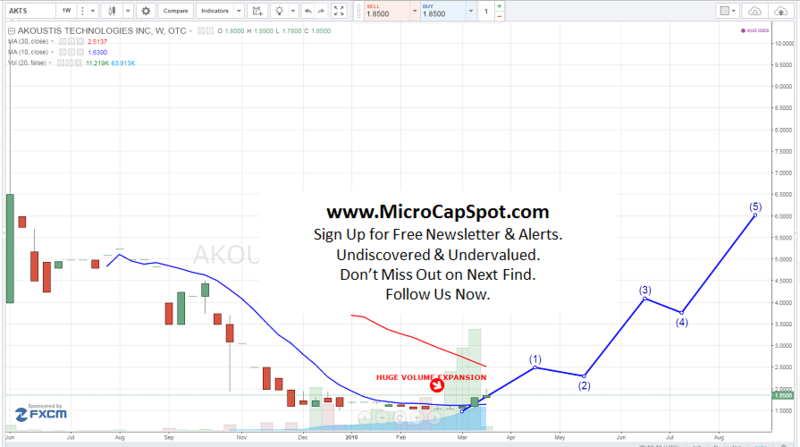 Akoustis Technologies Inc (OTCMKTS:AKTS) investors should be excited with all of the recent developments and turnaround at AKTS. AKTS is poised to enter a $1.6 billion market that is growing at a rapid pace. It will likely be uplisting in the near future (June time frame) and has very seasoned and experience management who founded multi-billion dollar company RF Micro Devices that merged with TriQuint to become Qorvo. There has been a slew of good news for the company that has pushed the stock up 30% since the beginning of the month on increasingly large volume. This stock is lightly traded with roughly 25,000 traded on a daily basis. The stock is currently trading around $1.90. In recent developments, Akoustis Technologies Inc (OTCMKTS:AKTS) has raised $500,000 in a private placement that was led by the Co-Chairman and CEO. Over 300,000 common stock shares were sold at a price of $1.60. The round was led by Akoustis Co-Chairman Jerry Neal, CEO Jeff Shealy, Director Jeff McMahon and included investments by other Directors and Akoustis Senior Management. This should be bullish for investors as it signals that executive management and the board are bullish on the company’s product offering and that it can become a disruptive player in the he fast growing billion dollar high-band RF BAW filter industry. The proceeds of the offering principally to support operations and the continued development and qualification of its single crystal piezoelectric materials, resonators and filter devices related to its Bulk ONE™ acoustic wave RF filter technology. AKTS is currently working to achieve performance requirements to support engagements with potential design clients and strategic partners. Ultimately, it anticipates current client engagements will result in 1-3 strategic development agreements within the next 6-9 months. Finally, it has engaged key Asia-Pacific sales channel partners to explore the Chinese mobile wireless market. AKTS has been boosting its management team and executive management by appointing two independent directors Jerry Neal and Dr. Arthur Geiss as Co-Chairmen of the Board. Both board members were previously employed by RF Micro Devices. One was a Co-Founder at RF Micro Devices and the other a former RF Micro Devices VP of Operations. This is another bullish sign as these are two heavy hitters in the industry. RF Micro Devices was a $2 billion company. Akoustis Technologies Inc (OTCMKTS:AKTS) announced that it has filed over 11 patents in key areas including base materials, resonator manufacturing, RF filter design, and mobile wireless systems utilizing single crystal RF Filters. The company is attempting to become a pure play supplier of high-band (4G/LTE/LTE-A) RF BAW filters, a fast growing $1.6 billion+ market, which today is dominated by two RF module manufacturers, Avago Technologies and Qorvo. AKTS is currently trading at a $25 million market valuation. This company is poised to breakout. It has the potential to be a huge company commanding a much higher market valuation upon the completion of its product. The market size of $1.6 billion is highly attractive and with leadership from prior RF Micro Devices, AKTS is poised for greatness. We will be updating on AKTS when more details emerge so make sure you are subscribed to Microcapspot so you know what’s going on with AKTS. Disclosure: we hold no position in AKTS either long or short at the publication of this article and we have not been compensated for this article.